"The zinc oxide pigment used ... as a sunscreen active agent in commercial formulations causes significant damage to DNA under UV illumination." I love it when one of my off the beaten path observations is right. I find and article supporting my thesis in the Journal of Oleo Science published by the Japan Oil Chemist's Society. The article is quite dull (no, really, it is horrendously mind-numbingly dull), but it confirms what I had suspected that sunscreens containing TiO2 or ZnO are damaging to the skin. Hisao HIDAKA, Hiroyuki KOBAYASHI, Takayoshi KOIKE, Tsugio SATO and Nick SERPONE, “DNA Damage Photoinduced by Cosmetic Pigments and Sunscreen Agents under Solar Exposure and Artificial UV Illumination”, J. Oleo Sci., Vol. 55, 249-261 (2006) . From the study, sun block using TiO2, ZnO or CeO2 results in more DNA damage than exposure of DNA to raw UV. Note: the image is somewhat deceptive in that it uses 3 different timescales: 360 minutes, 120 minutes and 180 minutes. Plot (a) is for "unprotected" DNA. Plot (b) is for DNA with TiO2, Plot (c) for DNA with ZnO. Plot(d) for DNA with CeO2. The white bands at the bottom are supercoiled forms of DNA (normal, healthy). The bands at the top are relaxed forms of DNA (damaged). 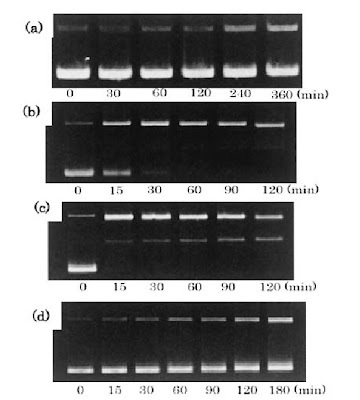 In the ZnO sample, the DNA further transitions to linear form - the bands in the middle of the plot. Fifteen minutes of exposure with TiO2 or ZnO results in more genetic damage than 3 hours of raw exposure. So if your choice without sunscreen is melanoma, what do you do? Which is the greater evil? barbara: given that 15 minutes of "protected" exposure results in more genetic damage than 3 hours of raw exposure, my advice would be to not kid yourself. Take sensible precautions against over exposure to sunlight. I simply do not believe that sunscreens containing TiO2 or ZnO are sensible precautions. In fact, I think that as a solution, they are more dangerous than the problem. Avoiding direct sun over-exposure is the only sensible solution. i beter go check the lotions we have here! thanks for the info! my mom suspect the same thing, too! acey: it is a little less straightforward than I present, but I think in 20-50 years time, there will be carefully worded backtracking from the current sunscreen position. The problem is that a lot of "science" is ideologically driven, not factually driven. The best advice is to avoid burning yourself in the sun and the simplest way to do this is (1) limit your exposure to the sun, (2) stay in the shade, (3) cover up with loose clothing. Too often, people want "magic bullet" solutions that allow them to live foolish lives, but they can get away with it because there is a pill they can take. You might recall that a few years ago, it was discovered and announced that trans-fatty acids were extremely harmful for you - worse than cholesterol - so people should avoid eating hydrogenated margarine. Notwithstanding that for around 30-40 years we had been told by health officials and agencies that margarine was a good and healthy choice. Trans-fats occur when oils are hydrogenated (essentially burned with hydrogen to turn liquid oil into solid, spreadable fat). So the advice is now to avoid hydrogenated margarine. Problem is that probably 99% of margarines out there are hydrogenated - there really isn't any way to make the liquid oils solid. If you want another wild prediction from me ... I predict in the next 20 years, they will discover that canola oil (also known as rapeseed oil) is unhealthy (despite being touted as healthy today). I don't like it at all. The taste, smell and texture is all wrong.
" Are you weaker than a woman?" "I did not stop it, because I had no right to."